Okay so Off-to-Nothingness suggested I draw Demona from Gargoyles, and I didn't really have time for much more than a quick sketch that was coloured quick and dirty... But I figure it gives an idea of what my take on Demona would be. Let me know what you think of super sketchy stuff like this. It's not perfect because the sketch itself is just pen, but it has a certain charm for me, and I'm wondering if you get the same feeling. When I first started watching your videos, I didn't really like your style. Now I can't stop looking at your stuff. I just love the how far everything gets pushed. In this piece, the legs is just amazing! I'm a HUGE fan of the sketchy stuff. My biggest inspirations in art were always where the lines were not uniform and "perfect", overly clean work gets glanced at and very often promptly forgotten by me. I normally don't like the really pointy calves but it really works for this character. Hello, Sycra. I am Giga. First I wanna start off by saying I enjoy your youtube channel for quite some time and finally at the beginning of this year I decided that your videos shouldn't go to waste on me. So I've been applying myself with the sole purpose of improving. So thanks for the motivation. Secondly, there is always something I find attractive about raw sketches. So yeah...it looks great! this is so raw and purple, really digging it! I think that rough sketches are really cool ...because it shows the way someone drew thier piece ....ok mostlikely it is because it still has the flow you get from sketches ...you know what i mean ? Your style really fits her. Favoriting. Hell, that's so 90s! I would love to see your take on Orchid from Killer Instinct! I never expected to randomly see something from gargoyles on here. That's part of my childhood there. A great new take on her! It certainly does have a charme to it,i´d actually prefer some of your pointy chins pages to any extremely rendered image of yours. yes very good^^ most amazing work on this~ can't wait to see much from you! Direct drawing brush-pen when? Bigger variety in line weight would make it much more livelier imo. But that's just me. I enjoy sketchy stuff too! it keeps a lot of the initial energy. and I think it suits you and your style. This is awesome. I think the sketchiness gives it a lot of energy even though its not really an action pose. man do i miss this show..
well done. by the way i love your updates on youtube i watch you there. most inspiring! Could I joeyfy your sycafied demona? I can't say I actually remember what Demona looked like originally, but this works really well! Omg that used to be my favorite character in this show. This sketch shows, at least for me, how your style fits just perfectly in creature design, your bold anatomy just makes them look even cooler and give you more space to go wild!! I don't mind sketchy stuff, they usually look very dynamic and fun, but I think in this case you should ignore our opinions and do what feels better for you. If you still have a goal to make more finished pieces, then you should just keep on it, if you are tired of trying that and just want to exhibit more of your sketches, then you should do that as well! I agree about the charm. It has a sketchbook feel to it...and I love looking at sketchbooks. Reminds me of your marker drawings. 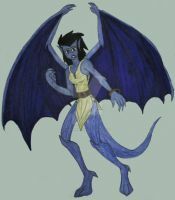 I think you need to do more Gargoyles cause your style meshes very well with theirs also I am a huge Demona fan and I LOVE THIS!